I was on my first ride with fresh painted bike. Here is the result. How can I prevent fuel comming out of the tank? Hi axel, found a seller in USA but they’re going to be quite expensive, £19 each plus delivery and import taxes and there is also a handling charge by the post office this meant they work out at about £45 to £50 each. I was going to see if anybody at the Scottish bash was still interested as the more we get the cheaper they become, I know at least one person was interested. 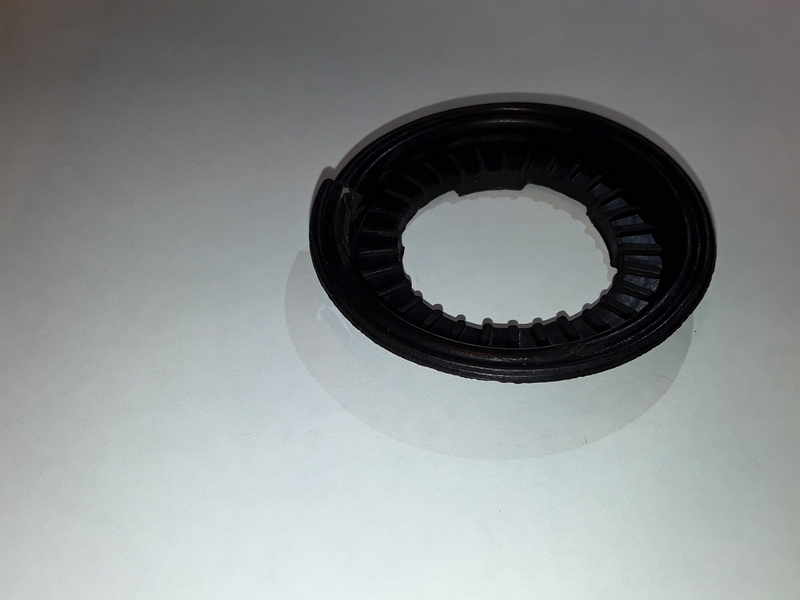 I tried another way by buying a cheap petrol cap of Ebay for a vf750 that was from China, the cap is rubbish but the rubber seal looks identical. Unfortunately I damaged the seal getting it off but will try fitting it to a vf1000 cap and see if it’s the correct size. This is a much cheaper way as the cap only cost about £15 delivered and I should be able to make a tool to remove seal without damaging it. I will let you know how I get on. Just checked on Ebay and the Chinese made vf750 caps can be bought for £5 with free delivery, will take the one I have to work with me tomorrow and an old vf1000 one and see if they are the same. I see the chinese offers here. I will spent the 7.5 € and see what it is about. In between I will try to disassemble my cap. Any advice on this? Maybe it is possible to cut something out of silicon. I will have a talk with the painter, how to rescue the tank. Maybe use gasoline resistant colour there. 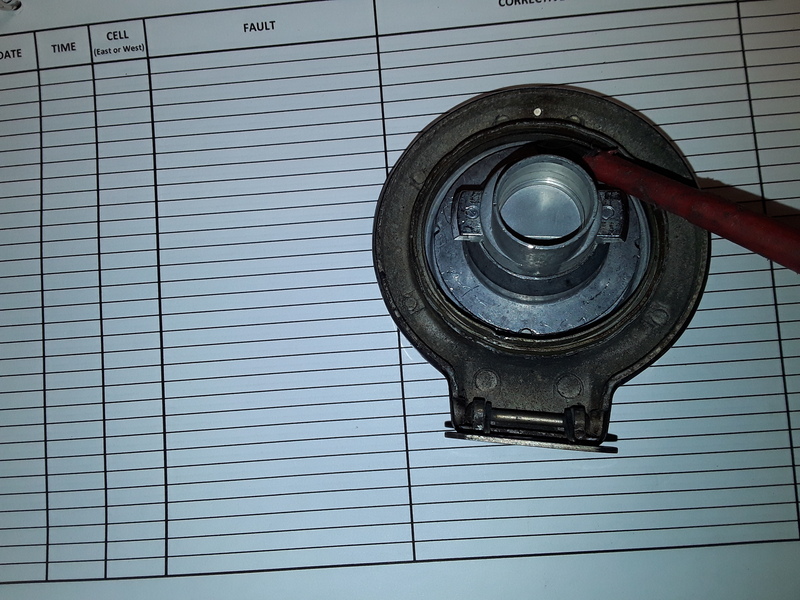 Hi axel, I managed to remove the gasket from the Chinese cap, it was quite easy when I looked closely at it. 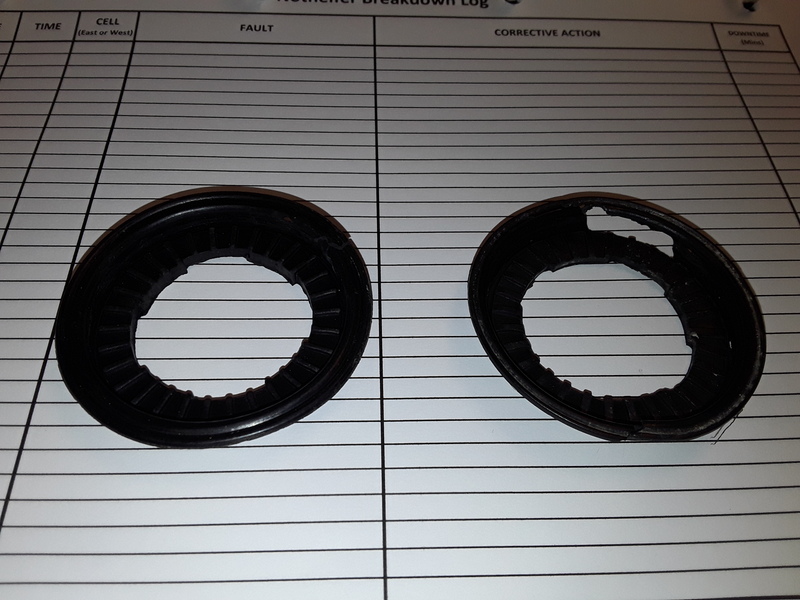 I will try removing one from an old Honda cap tomorrow and see if they match. You can see where I damaged it with my first attempt by trying to lever it off from the outside but when I used a thin screwdriver slid in from the inner hole it popped out easily with no further damage. I will take Honda cap to work tomorrow and remove original seal to compare it. You have to get out the golden ring (green arrow)? Did you anything on the bended metal (red circles)? You put the screw Driver in the blue marked area? 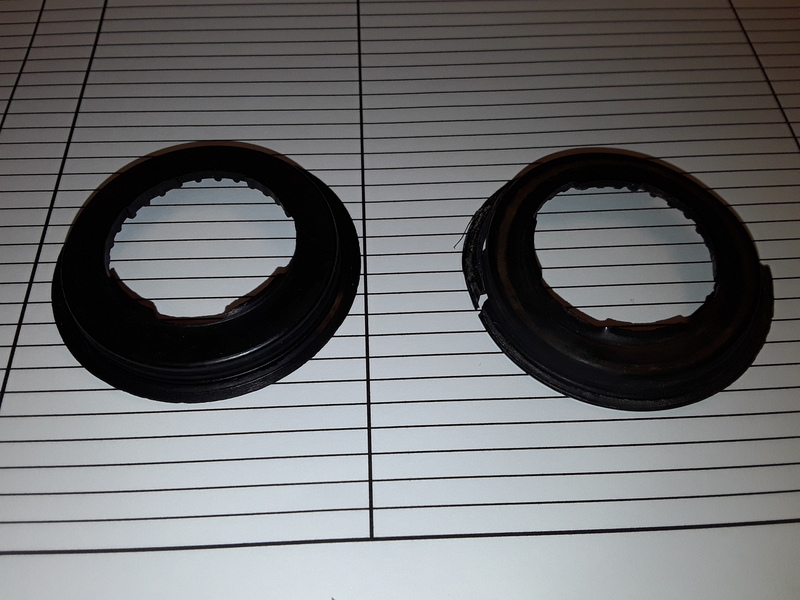 I removed the old hard rubber seal by putting screwdriver into the cutouts in centre of seal and levering it out, it broke into several pieces but gave me access to the under side of gold ring. I eased gold ring out with a larger flat screwdriver quite easily and without damaging it. My cap also had some of the aluminium bent like yours does at red circles but ring still came out no problem. The seal looks identical to the one on the Chinese cap but will have to check when I get to work later. The softer seal came out of the Chinese cap without having to remove gold ring though levering the ring up slightly would definitely help. The Chinese cap I bought wasn’t for a vf750 as I thought it was, it was for a cbx750 as it was the only one on Ebay with measurements in the advert. I have located a similar advert again and if buying 4 the price is only about £5 each, a lot cheaper than from USA! I will post a link to Ebay item and some pics of process later. I also removed one way valve from centre of cap to see if it could be repaired but it looks like it is sealed, there is an O ring that has degraded and more than likely would leak but one way valve works fine so don’t want to damage it trying to split it. Here is link to Ebay search, I looked at second on down £5.77 each. as long as the width of cap is 71mm it should be ok. I will purchase 4, two for me and two for people who asked me to order them from USA, if you want me to order one for you let me know and I will add it to order. The two seals are identical. Before levering off gold ring I would recommend marking with a permanent marker its location to make it easier to re fit later. 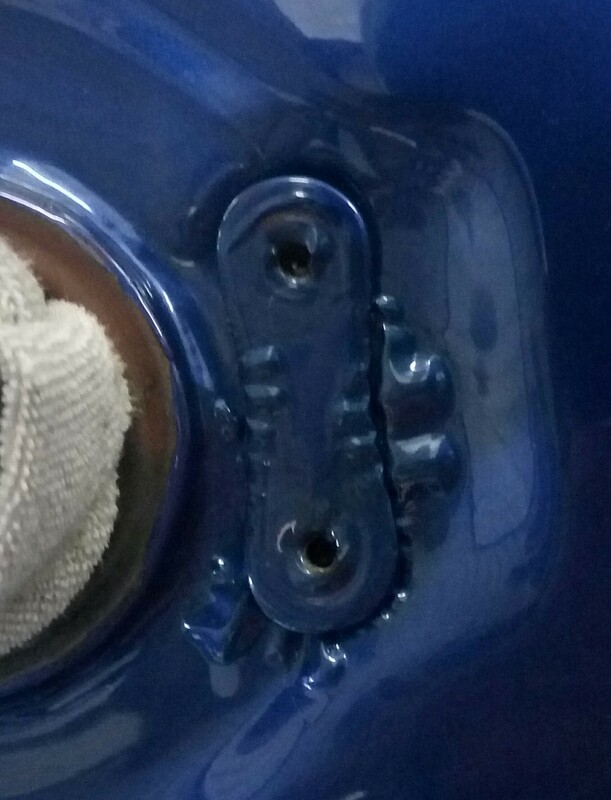 To remove ring put cap in locked position remove old seal any way you can and place screwdriver under ring like this. And use centre aluminium disc as your leverage point, once it moves a little repeat further round and keep repeating till ring is off. 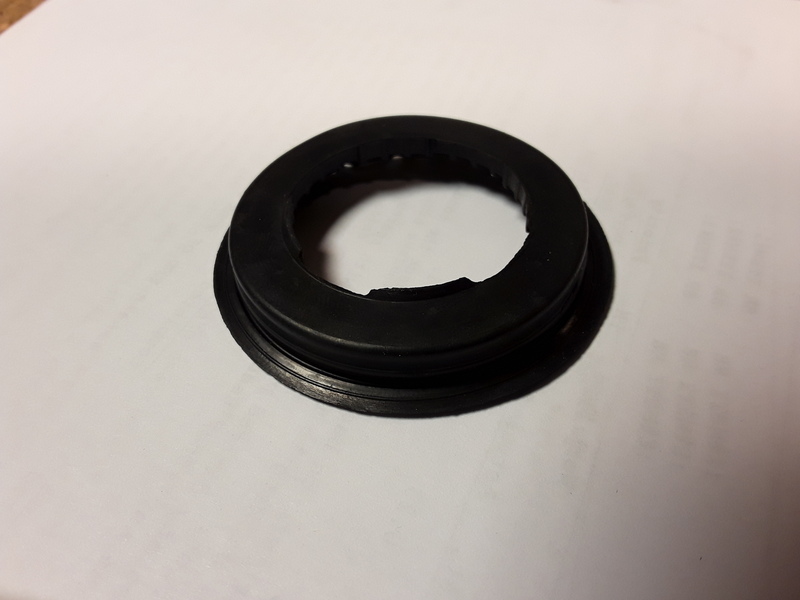 Insert new seal and refit ring into the same position as before using a hammer and piece of hard plastic or screwdriver placed into recess in ring until it is flush with steel frame. I’ve got two caps. I started with the one with harder seal.I managed to get it out. The seal broke into pieces. The other was easier. I was able not to destroy the seal. It is not as hard as the other. I ordered two VF750 caps from China. Now I have to wait for them. Is there any way to make the rubber smoother? My skills on a CAD program are not good enough to do that, if anybody else is good enough I can do the printing if they send me the stl file. 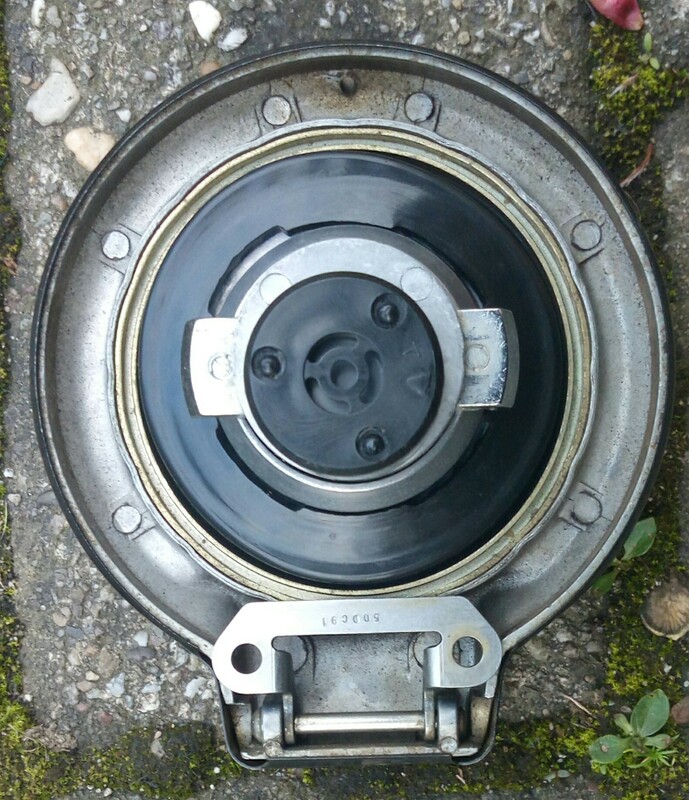 The one I removed from Chinese cap was really soft and exactly the same as Honda original so if you can wait for yours to be delivered from China which takes about 3-4 weeks that would be the quickest way. Don’t know of anyway of softening the old rubber though my cap leaked the same way as yours with the same effect on the paint! I only filled tank to half way for the first few weeks and the rubber softened slightly with use as it had stood for years with no petrol in tank. New caps from China have arrived, will remove seals when I get back into work on Tuesday, JLR have kindly donated O rings for one way valve so should have a repair kit ready by Wednesday, can’t remember who asked me for these I think it was David L and Andy viffer. Andy if you want it now let me know your address otherwise I will bring to Scotland. David I’m not sure if you still want this as it took me so long to arrange but send me your details if you do. Cheers Gary Scotland will do! I will strip Chinese caps down tomorrow while funnels are printing, who said men can’t multi task. Caps stripped down without damaging the seals and fitted one to my cap with a new O ring on the non return valve and back on the bike, took about 30 mins to do. Marked the gold ring and the aluminium housing to show where ring was originally fitted and removed ring with flat blade screwdriver then cleaned cap and fitted new seal and knocked gold ring back in place with the same screwdriver and a hammer, quite simple.